The Kosovo War wis an airmed conflict in Kosovo that stairtit in late Februar 1998 an lastit till 11 Juin 1999. ↑ Serbie claims that 1,008 Yugoslav sodgers an policemen war killt bi NATO bombin. NATO initially claimed that 5,000 Yugoslav servicemen had been killed and 10,000 had been wounded during the NATO air campaign. NATO haes syne revised this estimation tae 1,200 Yugoslav sodgers an polismen killt. ↑ "The Balkans/Allied Force: Statistics". planken.org. Retrieved 2012-02-28. ↑ Daniszewski, John (1999-04-14). "Yugoslav Troops Said to Cross Into Albania". Los Angeles Times. Retrieved 2012-02-20. ↑ Daly, Emma (1999-04-14). "War In The Balkans: Serbs enter Albania and burn village". The Independent. London. Retrieved 2012-02-20. ↑ Reitman, Valerie; Richter, Paul; Dahlburg, John-Thor (1999-06-10). "Yugoslav, NATO Generals Sign Peace Agreement for Kosovo / Alliance will end air campaign when Serbian troops pull out". San Francisco Chronicle. Retrieved 2012-02-20. ↑ Siobhán Wills (26 February 2009). Protecting Civilians: The Obligations of Peacekeepers. Oxford University Press. p. 219. ISBN 978-0-19-953387-9. Retrieved 24 February 2013. ↑ "BBC News – Serbian Vlastimir Djordjevic jailed over Kosovo murders". BBC News. 2011-02-24. Retrieved 2012-05-06. ↑ "Serbia charges police officers with 1999 Kosovo murders". SETimes.com. 2006-04-28. Retrieved 2012-05-06. ↑ John Pike. "Kosovo Liberation Army [KLA / UCK]". Globalsecurity.org. Retrieved 2012-05-06. ↑ 12 mal bewertet (24 March 1999). "Die Bundeswehr zieht in den Krieg". 60xdeutschland.de. Retrieved 2012-05-06. ↑ John Pike. "Kosovo Order of Battle". Globalsecurity.org. Retrieved 2012-02-20. ↑ 17.0 17.1 17.2 17.3 17.4 17.5 "NATO Operation Allied Force". Defense.gov. Archived frae the oreeginal on 2010-02-28. Retrieved 2012-02-28. ↑ "Fighting for a foreign land". BBC News. 1999-05-20. Retrieved 2012-02-28. ↑ "Russian volunteer's account of Kosovo". The Russia Journal. 1999-07-05. Archived frae the oreeginal on 2011-12-26. Retrieved 2012-02-28. ↑ 22.0 22.1 22.2 "Kosovo Memory Book Database Presentation and Evaluation" (PDF). Retrieved 6 February 2016. ↑ "Two die in Apache crash". BBC News. 1999-05-05. Retrieved 2012-05-06. ↑ John Pike. "Operation Allied Force". Globalsecurity.org. Retrieved 2012-02-28. ↑ "How to Take Down an F-117". Strategypage.com. 2005-11-21. Retrieved 2012-05-06. ↑ "Holloman commander recalls being shot down in Serbia". F-16.net. February 7, 2007. Retrieved 2012-05-06. ↑ "A-10 Thunderbolt II". Ejection-history.org.uk. Retrieved 2012-02-20. ↑ "F-117 damage said attributed to full moon". Atlanta Journal-Constitution. 1999-05-06. p. A14. Retrieved 2012-02-20. ↑ "Nato loses two planes". BBC News. 1999-05-02. Retrieved 2012-05-06. ↑ Andrei Kislyakov (October 9, 2007). "Unmanned Aerial Vehicles Increase In Numbers". Radardaily.com. RIA Novosti. Retrieved 2012-02-28. ↑ Robert Fisk (21 June 1999). "Serb army 'unscathed by Nato', KLA 'killed more Serbs than Nato did'". The Independent. London. Retrieved 13 March 2013. ↑ "NATO nam ubio 1.008 vojnika i policajaca". Mondo. Retrieved 2013-02-11. ↑ Andrew Cockburn (3 April 2011). "The limits of air power". Los Angeles Times. Retrieved 3 March 2013. ↑ Macdonald 2007, pp. 99. ↑ 41.0 41.1 "Facts and Figurues - War in Europe". www.pbs.org. Retrieved 27 January 2015. ↑ "Serbia: 13,000 killed and missing from Kosovo war – rights group". Relief Web. 6 October 2009. Retrieved 31 December 2012. ↑ Judah, Tim. The Serbs: History, Myth and the Destruction of Yugoslavia. Yale University Press. p. 150. ISBN 978-0-300-15826-7. 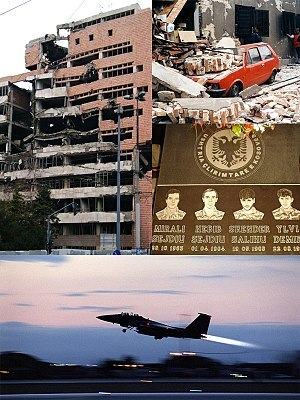 ↑ "Serbia marks anniversary of NATO bombing". B92. Retrieved 2012-05-06. ↑ "Civilian Deaths in the NATO Air Campaign – The Crisis In Kosovo". HRW. Retrieved January 20, 2012. ↑ "Kosovo Memory Book". HLC. Archived frae the oreeginal on 2012-06-03. ↑ Independent International Commission on Kosovo (2000). The Kosovo Report (PDF). Oxford: Oxford University Press. p. 2. ISBN 0199243093. ↑ Quackenbush, Stephen L. (2015). International Conflict: Logic and Evidence. Los Angeles: Sage. p. 202. ISBN 9781452240985. ↑ Boyle, Michael J. (2014). Violence After War: Explaining Instability in Post-Conflict States. Baltimore: Johns Hopkins University Press. p. 175. ISBN 9781421412573. This page wis last eeditit on 2 Juin 2018, at 18:40.